Location: City of Wakefield, West Yorkshire, England. Notes: Pontefract Castle is a castle in the town of Pontefract, in the City of Wakefield, West Yorkshire, England. King Richard II is thought to have died there. It was the site of a series of famous sieges during the 17th century English Civil War. The castle, on a rock to the east of the town above All Saints Church, was constructed in approximately 1070 by Ilbert de Lacy.on land which had been granted to him by William the Conqueror as a reward for his support during the Norman Conquest. There is, however, evidence of earlier occupation of the site. Initially the castle was a wooden structure which was replaced with stone over time. The Domesday Survey of 1086 recorded "Ilbert's Castle" which probably referred to Pontefract Castle. Robert de Lacy failed to support King Henry I during his power struggle with his brother, and the King confiscated the castle from the family during the 12th century. Roger de Lacy paid King Richard I 3,000 marks for the Honour of Pontefract, but the King retained possession of the castle. His successor, King John gave Lacy the castle in 1199, the year he ascended the throne. Roger died in 1213 and was succeeded by his eldest son, John. 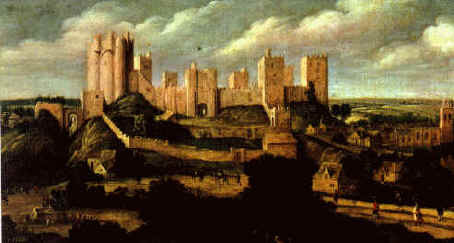 However, the King took possession of Castle Donington and Pontefract Castle. The de Lacys lived in the castle until the early 14th century. It was under the tenure of the de Lacys that the magnificent multilobate donjon was built. In 1311 the castle passed by marriage to the estates of the House of Lancaster. Thomas, Earl of Lancaster (1278-1322) was beheaded outside the castle walls six days after his defeat at the Battle of Boroughbridge, a sentence placed on him by King Edward II himself in the great hall. This resulted in the earl becoming a martyr with his tomb at Pontefract Priory becoming a shrine.It next went to Henry, Duke of Lancaster and subsequently to John of Gaunt, third son of King Edward III. He made the castle his personal residence, spending vast amounts of money improving it.